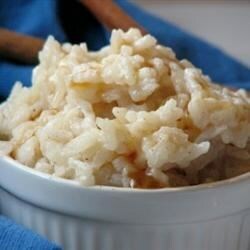 "I took a few ideas a created my own rice pudding recipe. My family loves it (me particularly), and it is quick and easy to make." Combine the rice and water in a saucepan over medium heat. Bring to a boil, and let simmer over low heat for 20 minutes, or until all of the water has been absorbed. Stir in 1 3/4 cups of the milk, sugar and maple flavoring, bring to a boil, and let simmer over medium heat until thick and creamy, about 15 minutes. Stir in the remaining milk, nutmeg, cinnamon, cloves and butter. Cook stirring over low heat for another 5 minutes. Pour into a casserole dish, or serving bowls, and let stand for 5 minutes before serving. This can be served cold also. Wonderful!! The maple flavor adds alot. I substituted and used skim milk and real maple syrup. Warm with some Cool Whip "Free"
Loved this recipe. I make it for breakfast as an alternative to oatmeal on cold mornings. I add dried apricots as well. Very tasty and creamy. Definately let sit so the creamy mixture will thicken perfectly - about 20 minutes. This is an excellent recipe. It thickened perfectly ... and has a delicate texture, and intense spice flavor. I'll be making this again, and again ... and again.